This latest series is a collection of six, 6″ x 6″ oil on panel paintings. 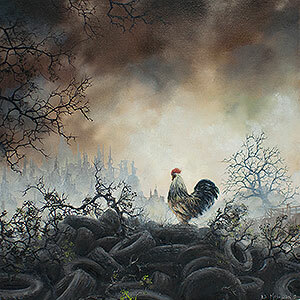 Each panel depicts a solitary rooster in an overgrown, industrial landscape. This series is a continuation on a theme my work has been addressing periodically over the past year. Most recently was my piece for Thinkspace’s 10th anniversary show titled “Everybody wants to Rule the World”. The six panels, collectively dubbed “Contenders,” are each named after losing presidential candidates. The thinly veiled political commentary is relatively conspicuous, however I try to avoid a partisan discussion in lieu of a celebration of arrogance in defeat. The subjects pay homage to Walter Mondale (Walter), George H.W. Bush (George), Bob Dole (Bob), Al Gore (Albert), John McCain/Kerry depending on the viewer’s disposition (John), and Mitt Romney (Willard). The paintings were completed this spring during the proverbial calm before the storm. They were still drying when the first of a new group of contenders were declaring their candidacy for the 2016 presidential race. My paintings often feature a variety of animals that can be viewed either symbolically or literally. In this case, ascribing the characteristics of politicians loudly vying for power (while occasionally looking ridiculous) to a group of roosters seemed to fit. However, the paintings are not necessarily just the embodiment of past and current politicians. They are observations of larger systems at work, those extending beyond the political arena. I use this sort of anthropomorphism in my work in an effort to generate a common metaphorical denominator. The viewer is encouraged to engage the work without excess associative baggage or simply view them at face value… chickens on the land.